I promised to post about my vacation to the Pacific Northwest, so here goes. I took a lot of photos, so I'll try to pick only the best ones to share with all of you plant lovers. 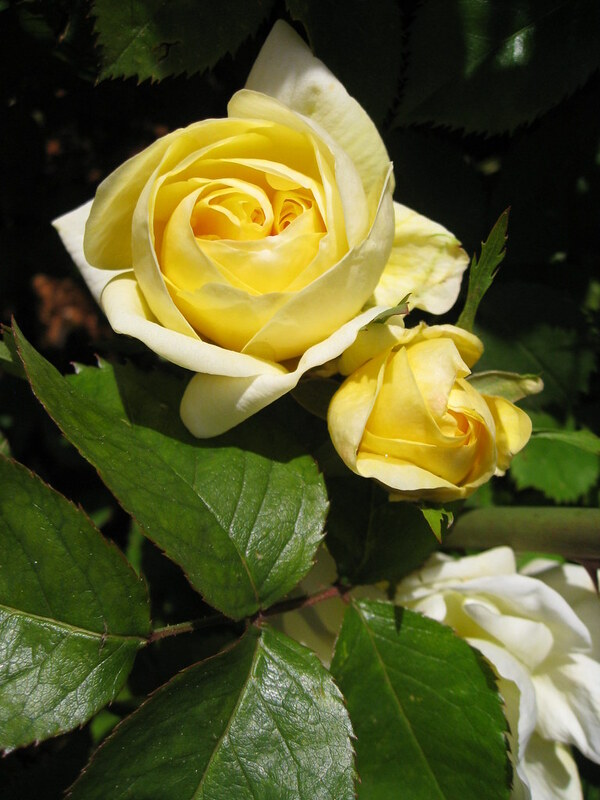 Let's start with the highlights from around Portland, OR -- The City of Roses. 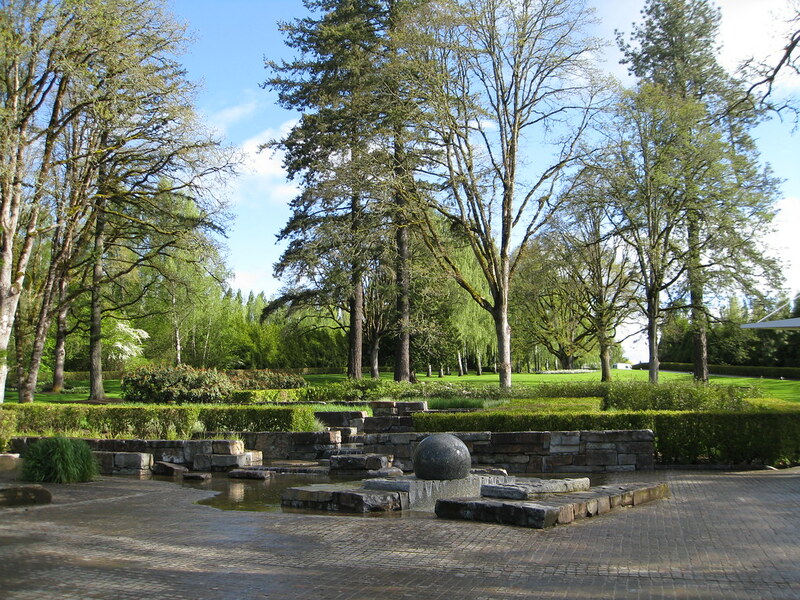 Our first stop was the Nike Worldwide Headquarters campus in Beaverton, OR. 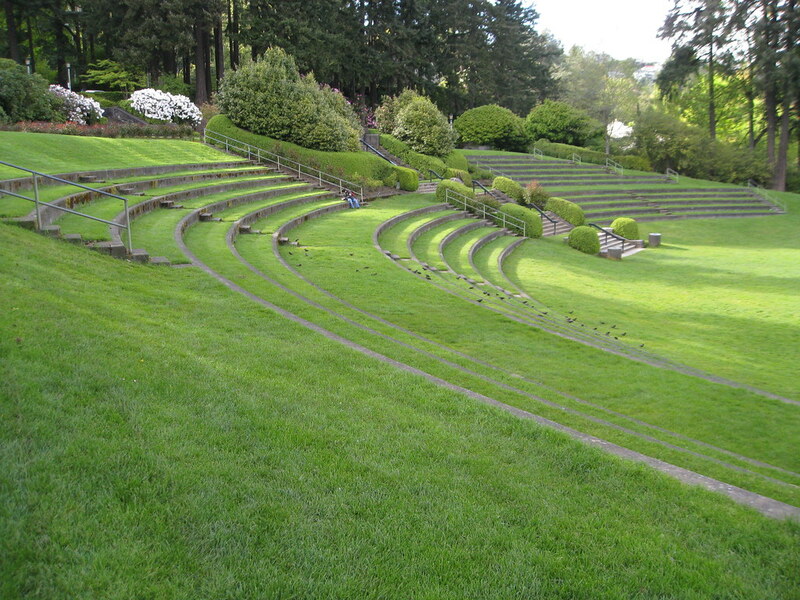 We were treated to a presentation by the landscape architect and then had a walking tour of the campus. 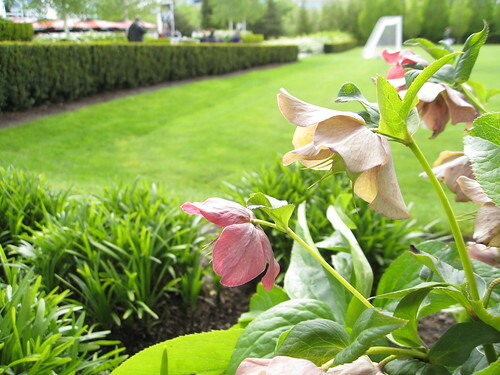 The landscape was designed with a berm around the entire property, which effectively created a beautiful environment that feels totally separate from the surrounding city of Beaverton. 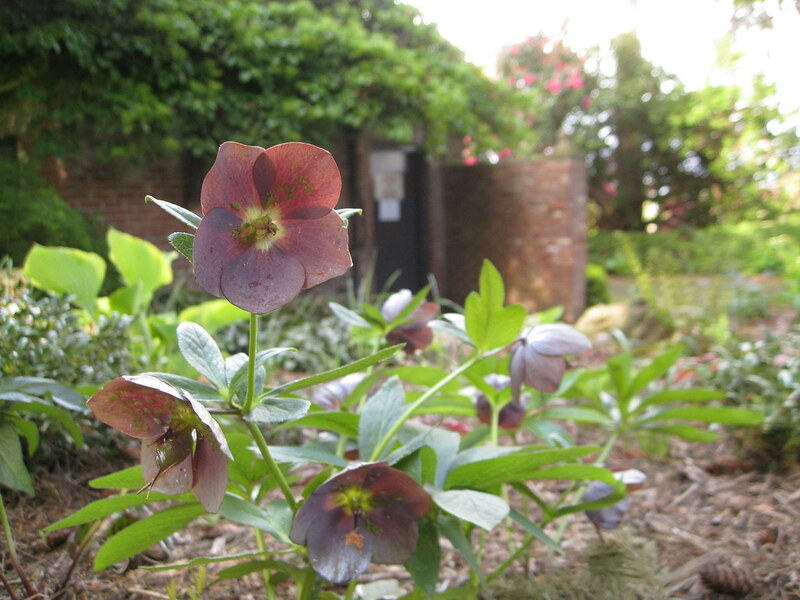 I developed my newest plant crush while we were at Nike: hellebores. I just loved the form of them, and their texture was unique in that it was papery. 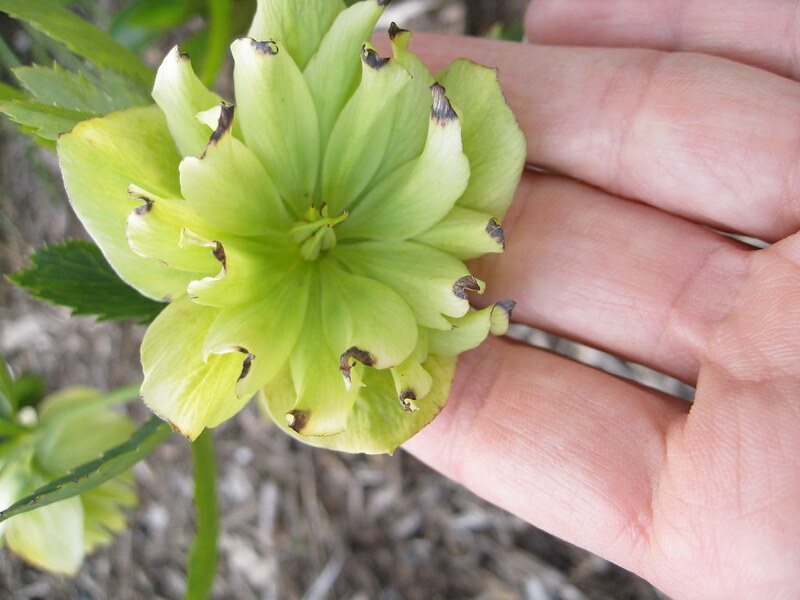 (Note: a little digging on the internet revealed this because what looks like petals are actually sepals.) We ended up seeing a lot of these throughout the trip in a number of different shapes and colors. 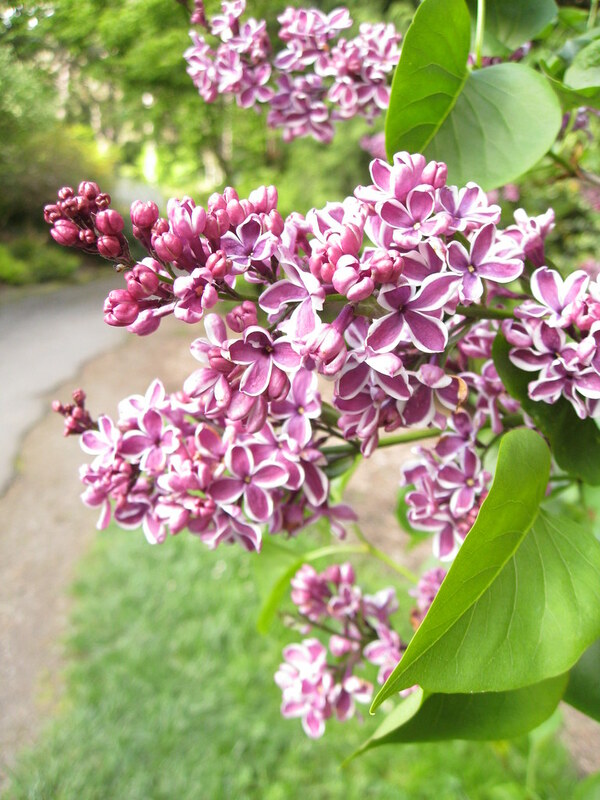 We Floridians had a hard time resisting a few of the perks of spring in Northern climates -- fragrant lilacs and soft, feathery lawns. These beautiful blue flowers are on striking three-foot tall stalks. We had seen them at Nike, as well. 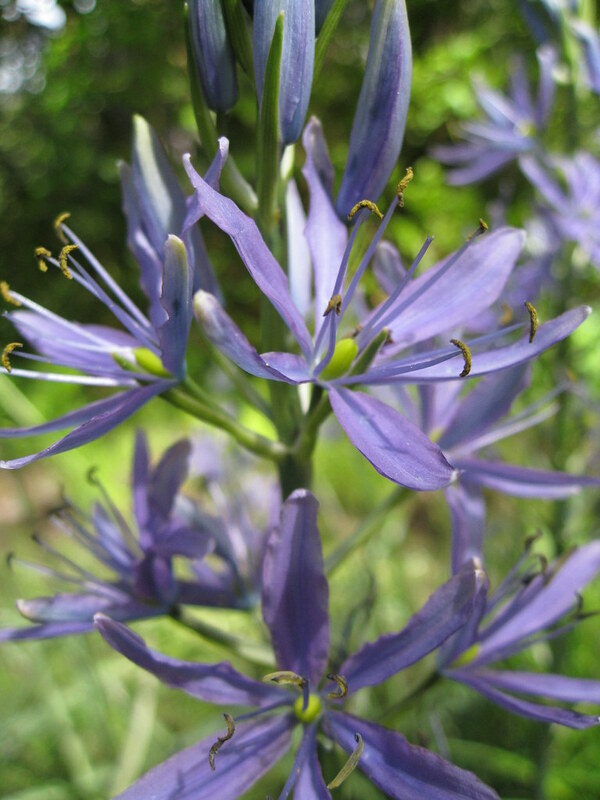 Our docent at Berry Botanic Garden told us that they're native bulb called Camassia, and that the Native Americans used to eat them. 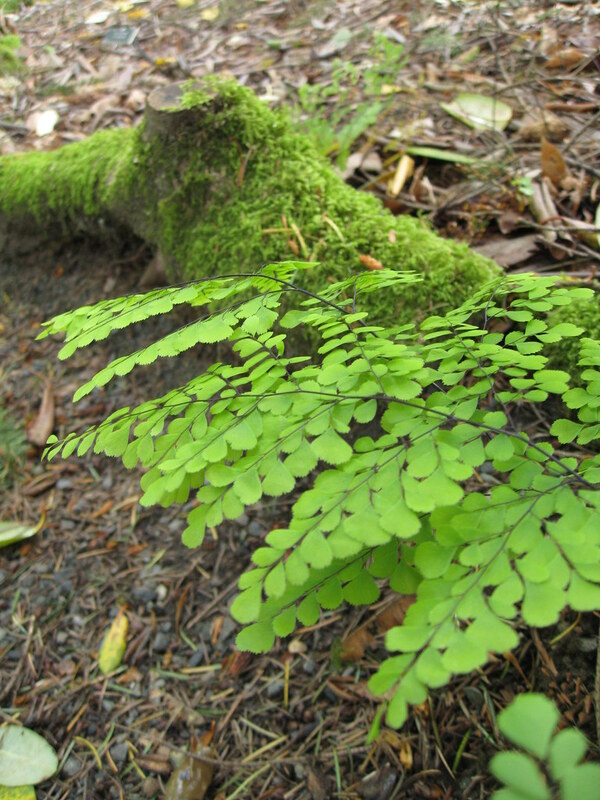 And of course, there were tons of beautiful ferns including this lovely maidenhair fern. 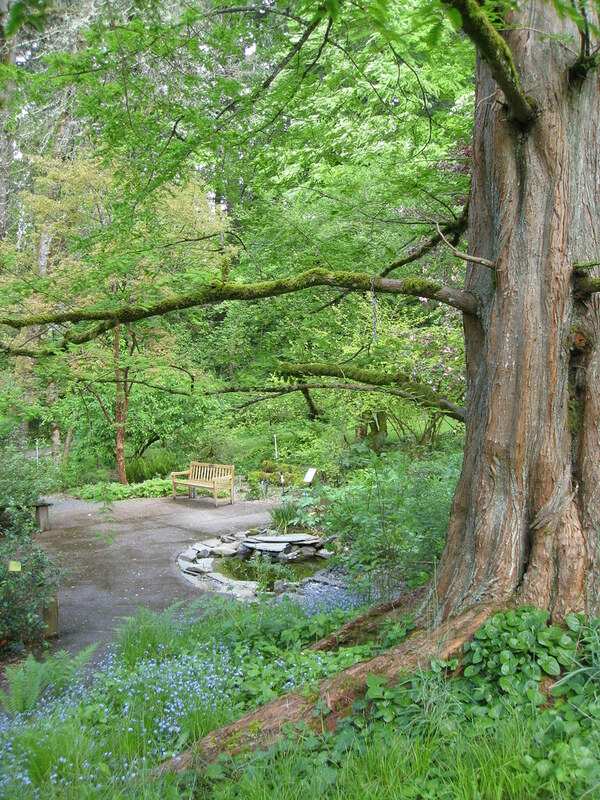 Then we headed to Washington Park, International Rose Test Garden, and the Japanese Garden where we were set loose to pursue free-for-all, self-guided tours. 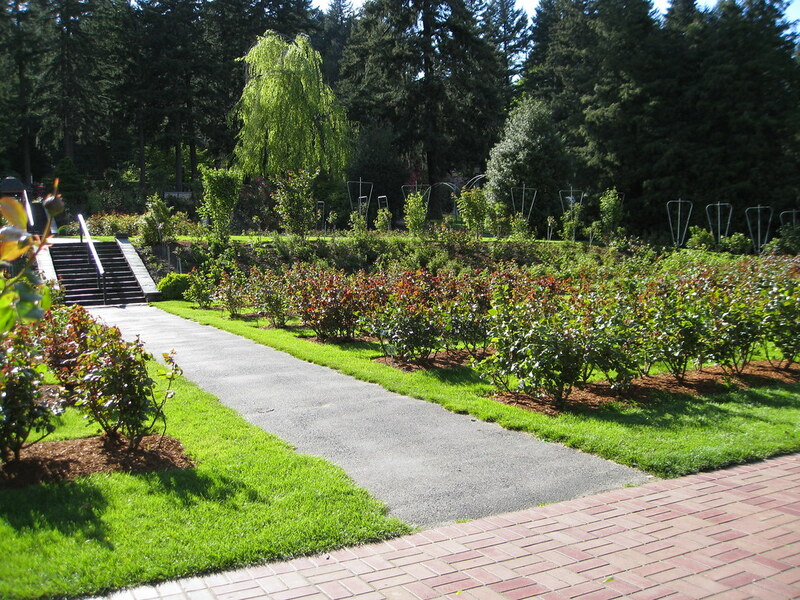 I'd been to the Japanese Garden before on a previous trip, so Jason and I decided to poke around the rose garden and the park. Plus, it had been a full day and it seemed like it would be nice to just wander and relax. This is where I discovered another one of my other plant crushes -- these large shrubs that put off a wonderfully soft, sweet smell. 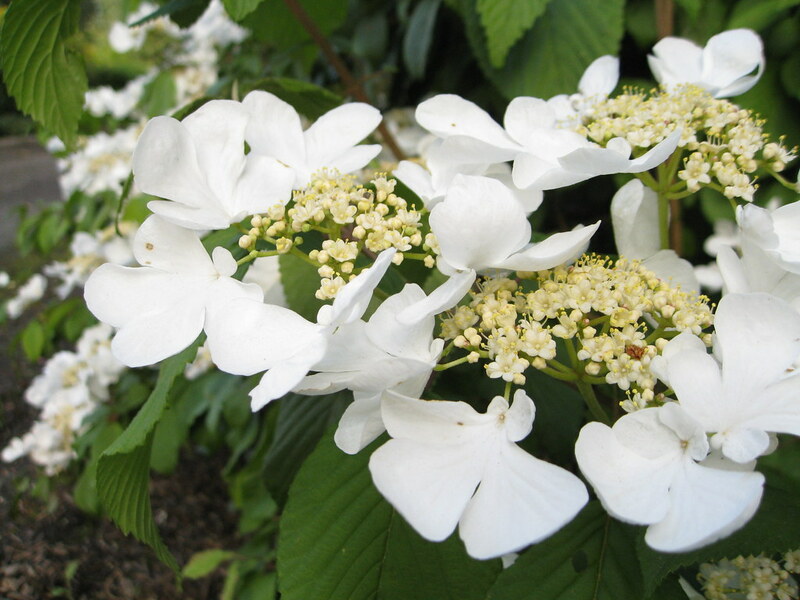 At first I thought they might be a hydrangea of sorts, but it turns out they're a viburnum. And here are some of the yet-to-be-blooming roses in the rose garden. I'm imagining what this would look and smell like come mid-summer. Amazing, I'm sure! Well, that's about all the time I have for now. 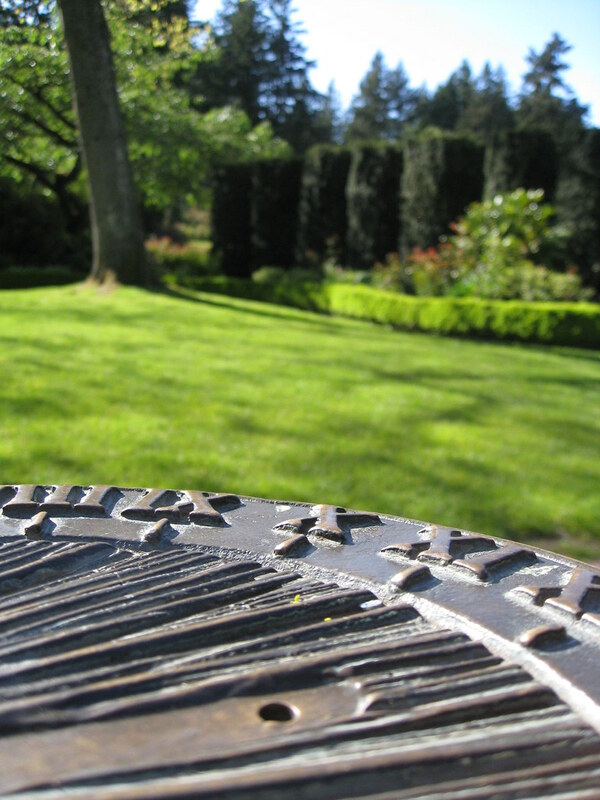 Here's one last shot from the Portland Rose garden. They actually had what looked like bananas and brugmansias in this garden, but they were pretty puny at this point in the spring and not at all worth taking a picture of. I promise that the next posts will feature more of the bold plant combinations that you've come to expect from Cannas and Bananas. You'd think I'd be raving about this beautiful amaryllis. 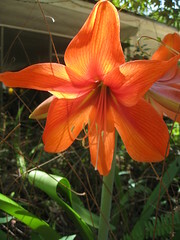 It's a stunning shade of coral and the blooms are at least six inches across. Truth is, I've been pretty disappointed with this plant because it's been a perennial underachiever in my yard. I planted it back in early 2001 after receiving it as a gift plant just before Christmas. While it's put up plenty of great foliage over the years, it had never bloomed. Until now, that is. And bless its heart, it was kind enough to open up just before we left for our recent vacation to the Pacific Northwest. By the time we got back, the flowers had wilted down to little wisps. Speaking of the Pacific Northwest, I shot nearly 400 photos of plants, gardens, and other fun things while I was out there. In the next weeks, I'll be putting up a few posts highlighting what I saw and revealing my newest plant crush. 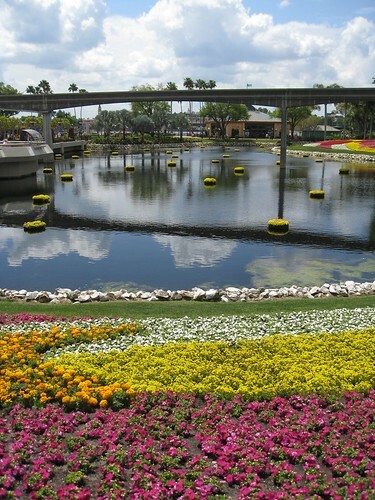 The Epcot International Flower and Garden Show wraps up this coming weekend. If you've never been, it's totally worth checking out. 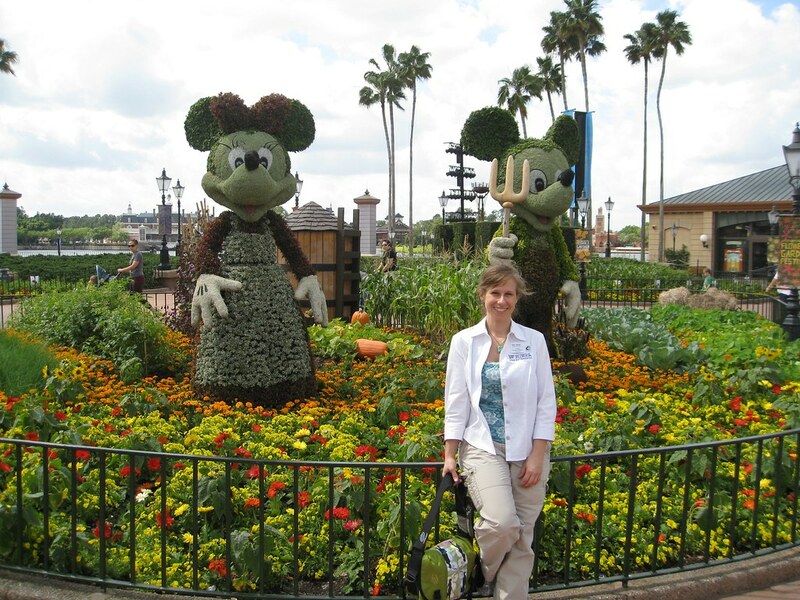 The Disney Horticulture staff create stunning plant displays all over the park, including some amazing topiaries. 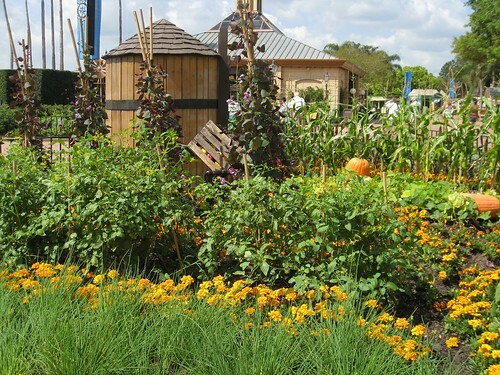 They also feature a special pavilion called Garden Town where you can go and listen to talks from the big names in gardening. If you can't make it this year, you can always mark your calendar for next year. The festival typically begins in March and runs through mid-May. These photos were taken when I was there a few weeks back helping out with the Florida Master Gardener "Ask the Expert" booth. The first shot features a new topiary installation that played off of "American Gothic." 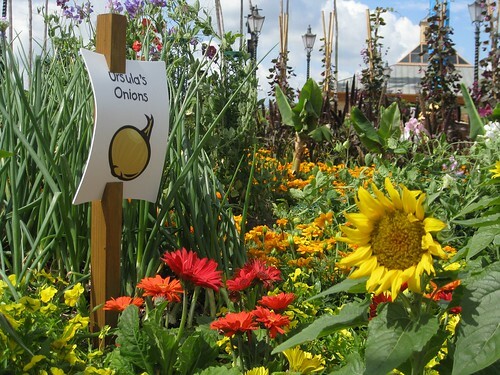 I loved that the bed included a number of edibles, given that people have gone so crazy over vegetable gardening. Okay, so the purple lablab beans in this photo aren't exactly edible, but they do look good growing up those bamboo tripods. I'll bet that the tomato plants in the mid-ground are setting fruit by now. 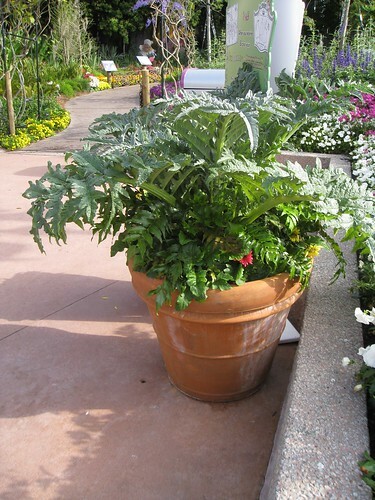 I was also excited to see that the horticulture staff had included cardoon in a few of the planters this year. 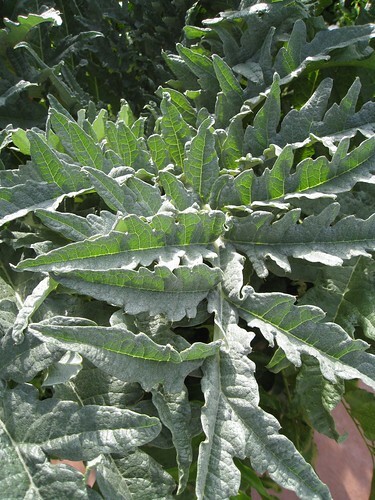 I tried to start some cardoon from seed last year, but my poor plants never made it past the seedling stage. Here's a close-up of the amazing texture on the leaves. 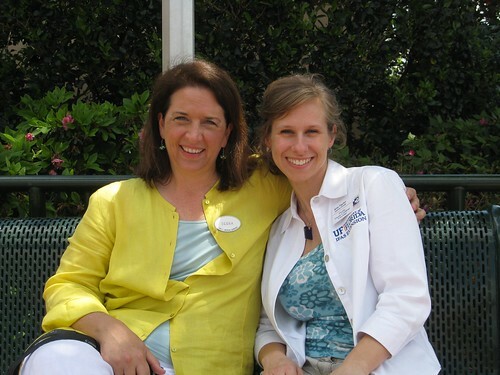 I also got a chance to visit with my friend Debra Prinzing from the Garden Writers Association. She was the featured speaker that weekend and was talking about her beautiful book Stylish Sheds and Elegant Hideaways. 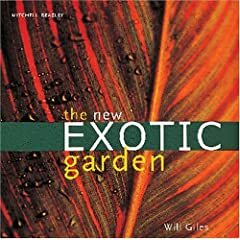 And just before I saw Debra, I learned that she's the new garden editor a contributing editor for gardening at Better Homes and Gardens. How cool is that? Congratulations, Debra! Every year there's at least one plant that people stop by the booth and keep asking about. This spring, it was definitely delphinium. 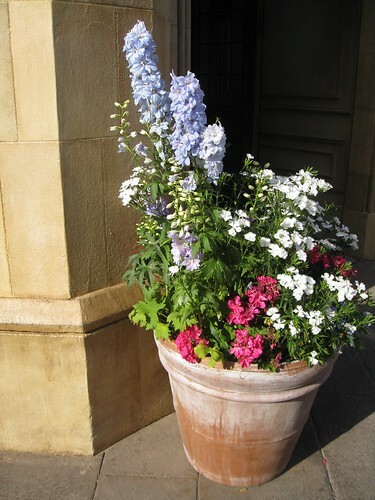 I found this container with delphinium over in the England pavilion, though they've probably changed it out by now to a warmer-season plant. And finally, here's a signature view over one of the lagoons by the monorail. People just love the floating containers and the broad strokes of colorful bedding plants. If you look closely, you can see that the pink plants were just installed. They look like petunias and they probably replaced a cool-season annual. They'll no doubt fill in over time to create the wall-to-wall plants look that Disney is known for. Well, I hope to blog again soon about my own garden. I still have some design tweaking to do in the front yard, but it's amazing how quickly all of my new plants are all filling in. I get butterflies every time I pull into the driveway and see how well my new cannas and bananas are doing. Stay tuned for photos!